Because earning and displaying them are two different things, here's our help. Nursing is a growing profession, so the use of credentials in the profession such as ours is essential to designate the complex levels of attained education, licensure, certification and achievement of a professional. Credentials are a way of identifying and ensuring credibility and competence to the consumers of nursing care and also members of the healthcare team. 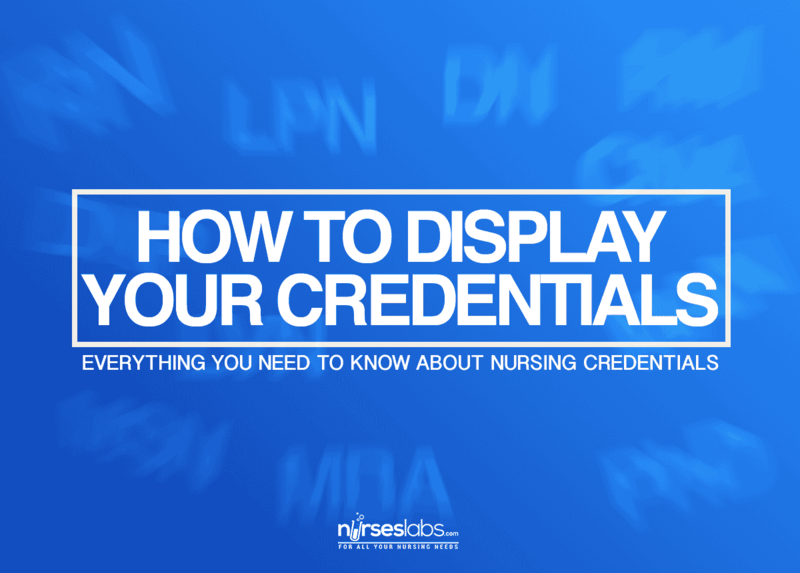 Here’s our guide for nurses on how to properly display your nursing and non-nursing credentials. And there’s a reason behind it. Educational degree comes first because it is considered a permanent credential, meaning it cannot be taken away unless under extreme circumstances. Licensure and state designations are required for nursing practice and are only revoked for serious professional misconduct. Certifications generally must be periodically renewed by examination or the completion of a prescribed number of continuing education units (CEUs) and is sometimes voluntary. Awards, honors, and other recognitions are always voluntary. What are some examples of degrees? Educational degrees include doctoral degrees (PhD, DNP, EdD, DNS), master’s degrees (MSN, MAN, MS, MA), bachelor’s degrees (BS, BSN, BA), and associate degrees (AD, ADN). Licensure credentials include RN and LPN. State designations or requirements recognize authority to practice at a more advanced level in the state and include APRN (Advanced Practice Registered Nurse), NP (Nurse Practitioner), and CNS (Clinical Nurse Specialist). National certifications are awarded through accredited certifying bodies such as the American Nurses Credentialing Center (ANCC), includes RN-BC (Registered Nurse-Board Certified) and FNP-BC (Family Nurse Practitioner-Board Certified). Awards and honors recognize outstanding achievements in nursing such as FAAN (Fellow of the American Academy of Nursing). Other certifications include non-nursing certifications that recognize additional skills. Examples include, EMT-Basic/EMT awarded by the National Registry of Emergency Medical Technicians. On legal documents such as prescriptions, charting notes and other medical records, you must use the credentials required by your state for your area of practice. For any other professional endeavours like writing for a publication, providing testimony in court, and speaking engagements, use all your relevant credentials. List the highest education degree first (e.g. Tyrone Lamister, MSN, RN). In most cases, one degree is enough but if your second degree is in another relevant field, you must choose to list it. Note that the highest non-nursing degree is listed first, followed by the highest nursing degree. A nurse who has a master’s in non-nursing field might choose Edward Starch, MEd, BSN, RN. If you have a doctorate and master’s degree, omit your baccalaureate degree (e.g. Kelly C. Targaryen, PhD, MSN). Nurses can also hold non-nursing credentials including academic degrees. These are usually omitted unless they are related to the nurse’s job. For instance, a staff nurse would likely not list an MBA, but a nurse manager might choose to do so. Multiple nursing certifications may be listed in the order you prefer, but consider listing them either in order of relevance to your practice or in the order they were obtained, with the most recent first. For example, a registered midwife who later on becomes a registered nurse may choose Sersee Lamister, RM, RN. On the other hand, always list non-nursing certification last. A nurse’s credentials are comma-separated from the person’s name and from each other (e.g. John Shaw, BSN, RN). They are usually written without periods within the credentials (e.g. “RN” not “R.N.”). RNs are not required by law to be certified in a certain specialty. The law doesn’t necessitate a certified medical-surgical registered nurse (CMSRN), for example, to work on a the medical-surgical floor, and most med-surg nurses are not CMSRNs. Certifications do, however, instill professionalism and makes the nurse more attractive to prospective and current employers. Additionally, being a certified nurse is another factor to have higher salary differential over non-certified colleagues. Some hospitals and other health care facilities are willing to pay a certified nurse extra when he or she works within their specialty. Also, some hospitals may require certain nurses, such as nursing supervisors or lead nurses, be certified. Certification instills confidence in the nurses. To learn more about certification and credentialing, visit American Nurses Credentialing Center. Just had to comment that I love your choice of GoT name examples! Thanks for clearing up the confusion for me about what to list first.